AME Jobs – Welcome to all in Aviation Dreamer. You can find out the best Airlines jobs or Aviation Jobs update here, from all over the World. Also, you will get Aviation Interview Tips for your Ground Staff Interview. 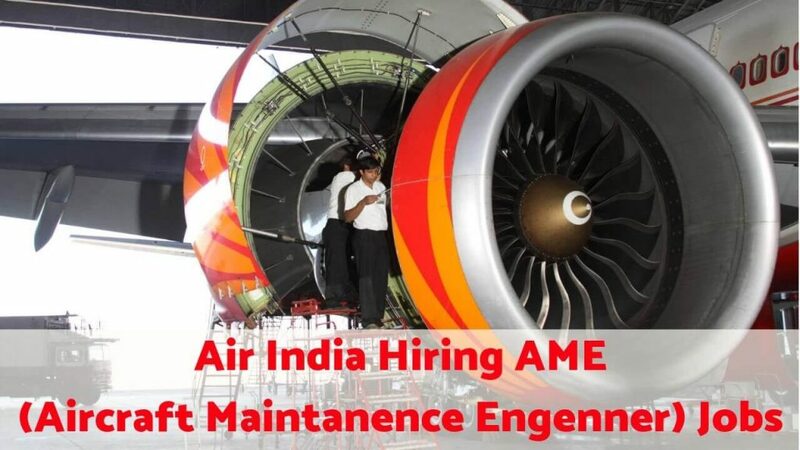 So, in today’s article, I will update you about Air India AME Jobs in India 2019(Walk-in Interview) – Full Details. CAR 66 CAT B1 license on B777-200LR/300ER series aircraft fitted with GE-90 engine. Minimum one-year maintenance experience as certifying support staff with CAR 145 approved organization on B737-800/ CFM56 and B777-200LR/300ER fitted with GE-90. Qualification – As stated above, preference will be given to the candidates having working experience of at least 01 years on B737-800 aircraft and B777-200LR/300ER series aircraft as a certifying AME. Preference will also be given to those who have additional type-rating on A320/ ATR-72 whether as B1 or Cat “A”. Age Limit ( as on 1st JANUARY 2019) – General Category – Not above 55 years as on 1stJAN 2019 OBC – Not above 58 years as on 1st JAN 2019, SC/ST – Not above 60 years as on 1st JAN 2019. Ex-Servicemen – as per Govt. rules but not above 60 years. The shortlisted candidates will be inducted as per vacancies subject to being found FIT in the PreEmployment Medical Examination. call letter along with requisite Fee of Rs.1000/- by Demand Draft and documents as indicated below. Applicants meeting the laid down eligibility criteria mentioned in this advertisement as on 1 January 2019 are required to download the application form from our website and send the duly filled application form to Chief Maintenance Manager, Air India Engineering Services Ltd.MRO hangar, Chakkai, Trivandrum, Kerala-695007 in the prescribed format only and compulsory a subject line as “Application for the post of Aircraft Maintenance Engineer – Your Name”. The Non-refundable Application Fee of Rs.1000/- (Rupees One thousand only) by means of a Demand Draft drawn in favor of “Air India Engineering Services Limited” payable at New Delhi should not be sent along with your application but should be submitted at the time of interview. No fees to be paid by Ex-Servicemen/ SC/ST candidates. Please mention your full name and the post applied for on the reverse of the Demand Draft.